I would like to highlight the pork knuckle in particular – a true pillar of classic Czech cuisine. In my recipe the knuckle is slowly cooked to retain its succulence. 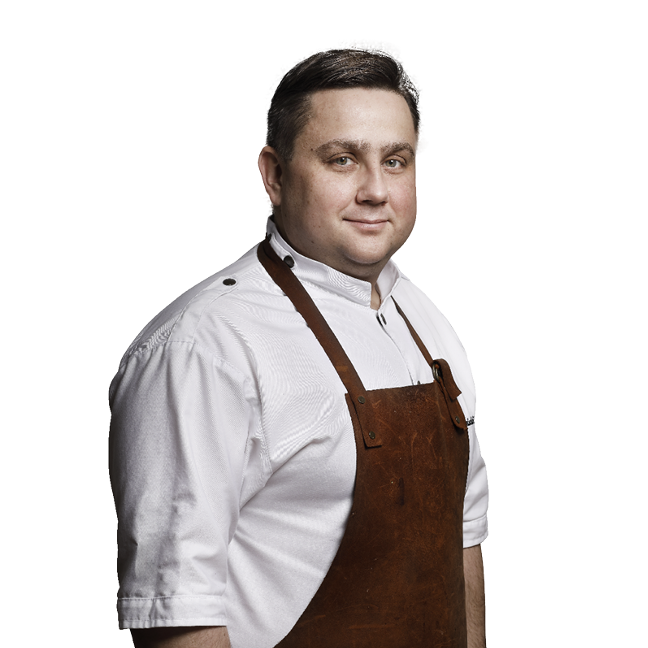 Jan Punčochář is the Chef of Grand Cru Restaurant and a two-time champion of the Zlatý Kuchař (Golden Chef) poll. He functioned as a Chef for Michelin Star restaurants in Austria and Germany. His culinary glossaries, recipes and other observations can be found on the news portal lidovky.cz. 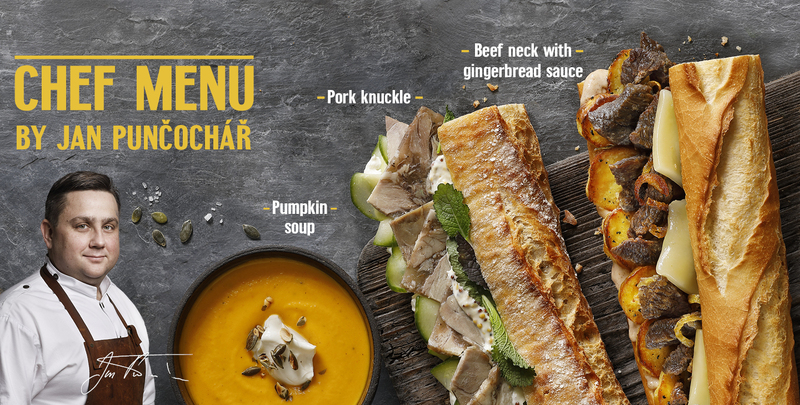 In the Pork knuckle baguette, the taste of meat is complemented exquisitely with horseradish spread, mustard dressing and mustard leaves. An entirely new level of freshness enters the scene with brined cucumbers. This baguette proves that even simple, easily accessible ingredients can be turned into gold and create a wonderful meal in a modern an unorthodox shape. Second baguette of the Chef Menu is Beef neck with gingerbread sauce. Slowing down the process of confitting the meat gives it a tender and delicate texture which is complemented by slices of potatoes baked with marjoram. Everything is tied together with roasted onions, grilled mountain cheese, and rich gingerbread sauce, perfectly emphasizing the beef. It wouldn’t be a proper Winter Chef Menu without a delicious, creamy soup. Jan Punčochář prepared a mildly spicy pumpkin soup with horseradish and sour cream. It’s sprinkled with roasted pumpkin seeds to add a naughty bit of crunch. 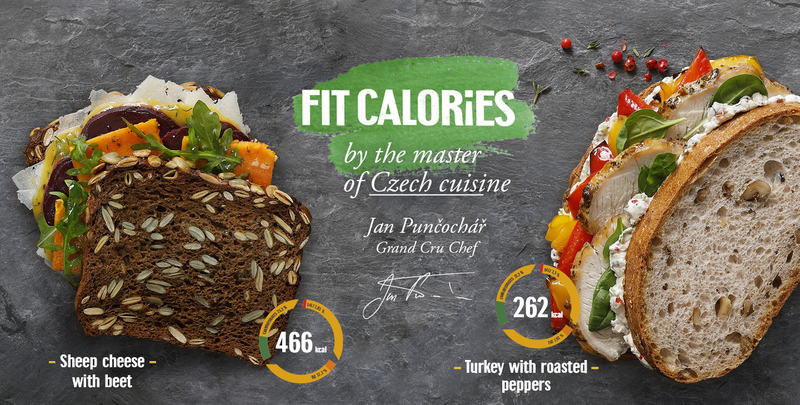 Let’s take a look at the healthy Fit Calories menu by the master of Czech cuisine. Two slices of delicious walnut bread hide Turkey with roasted peppers. Colorful peppers are combined with turkey breast and tarragon gervais with pink peppercorn. Add fresh baby spinach and you have a mighty healthy snack. And last but not least, the vegetarian option - Sheep milk cheese with beetroot. Inside pumpkinseed bread you’ll find marinated red beetroot and butternut squash, sheep milk cheese, honey dressing and arugula.